We all like attractive landscaping, especially the components that are functional as well as beautiful, like fruit trees. Unfortunately, they have a finite life span and eventually must come down. 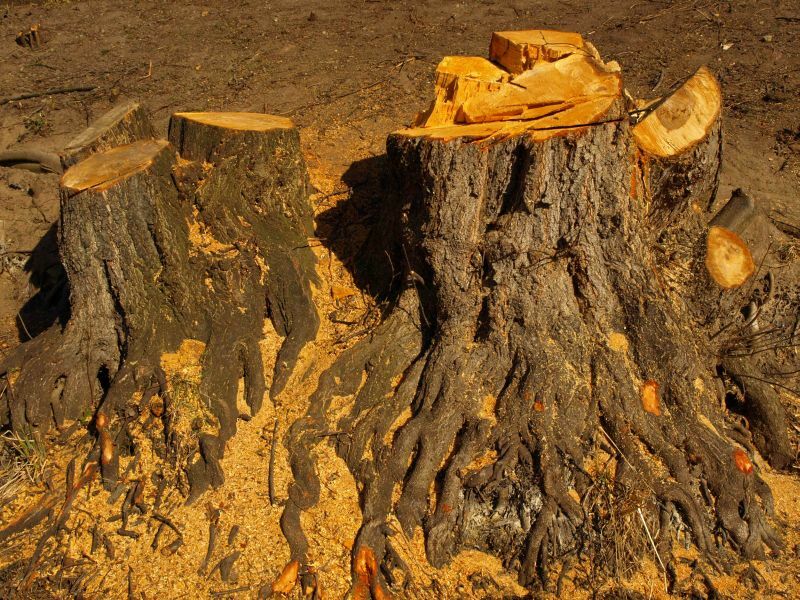 This article explains how to remove a tree stump easily without using a stump grinder. Its simply a matter of methodically trenching around the stump and cutting out the roots with a nursery digging spade and a utility bar. Many people find out that that cute tree they planted years ago is now a monster and the spreading roots are threatening expensive home foundation repairs. That problematic tree in the yard has been cut down and youve hauled away all the branches. All thats left now is that big tree stump sticking up out of the yard like a bad, aching molar. So howre you going to remove it? For most of us it boils down to three choices. The first one is that you can call someone that has a stump grinder to take care it out for you. If this is the case, find local reviews arborists and landscape services at Angies List. Take the Tour! Secondly, you could go to a local home improvement center and rent a tree grinder to tackle the job. Thats a superior choice but it involves renting a heavy piece of equipment. Now this narrows it down to whats behind door number three  the DIY way. This is how to go about removing a tree stump by yourself. This DIY project wont break the bank as far as tools are concerned. All homeowners should own a basic assortment of hand tools. The first and main operation in the stump removal process is carving out a trench 8 to 12 inches wide surrounding the radius of the tree stump. Its like a small moat. The inner side of the trench will be at a minimum of 15 to 20 inches away from your stump. This will afford you lots of area to work with. Trench the moat downwards and in the direction of the stumps underside; think of a teacups shape. Use the spade to do this. 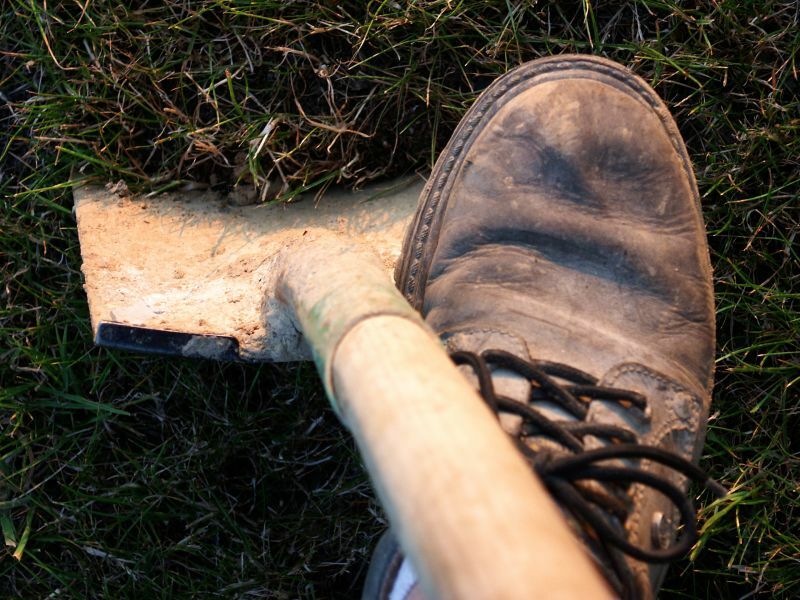 This trenching is easier when your dirt is wet, obviously, so tackle this job following a rain if possible. There are two objectives of this step: to methodically remove the trunk from the dirt and to expose the stumps roots so that you can cut them out. As your moat becomes deeper, it will begin to expose tree roots. Your utility bar will have a flat end for hammering on and on the other end a flat blade. The blade should maintain a sharp edge for root cutting or itll work you like an underfed mule. If its not sharp, sharpen it using a file or bench grinder. Youre going to take out sections of your stumps roots as you find them. Slash the sections at the inside and outside edges of your trench so that the roots wont get in the way of the digging process. Drive the bars blade into a root beginning your cut and them slam the opposite end of the bar with your hammer to drive it through. If you need to sharpen your blade, do it. In most cases, itll dull up fairly quickly. As you make progress, the tree trunk will become looser in the ground. Periodically wiggling it in a back and forth motion will make your trenching, if not more fun, more doable. Also, it will allow you an easier shot at roots going downward instead of out laterally. Soon youll be at looking at the final anchor root (the tap root). Cut through it. All youve got to do now is get rid of the stump. Chop it up if its too large to handle. Youre done!